When it's Spring and Turtle is outside planting beans, he likes to listen to the radio; sometimes, he likes to sing along to his favourite songs. One beautiful, sunny day, Turtle was singing along to "Lovin' You" by Minnie Riperton when, much to Turtle's dismay, his radio was carried off by a swarm of golden butterflies. Not one to be thwarted by unappreciative insects, Turtle continued with the song 'a capella'. 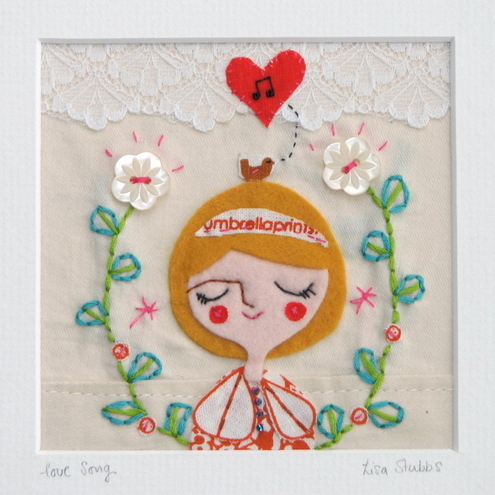 Love Song - fabric art by Lil Sonny Sky. Her work is AMAZING! Thank you for sharing. No problem Lisa. It's so pretty.